I love this little house. So simple, so beautiful. No kitchen – just a small fridge. I think if people really wanted to save money and go even smaller the kitchen could be outside (grill/smoker). 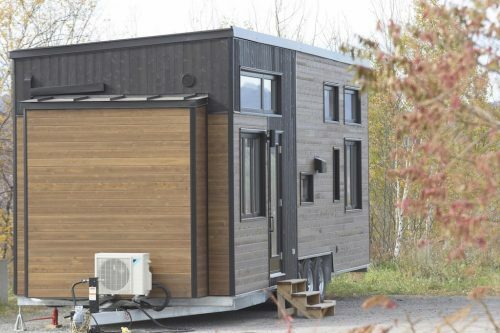 And the tiny houses could become even tinier. Great job – great use of space. This is positively darling, and the craftsmanship looks wonderful! 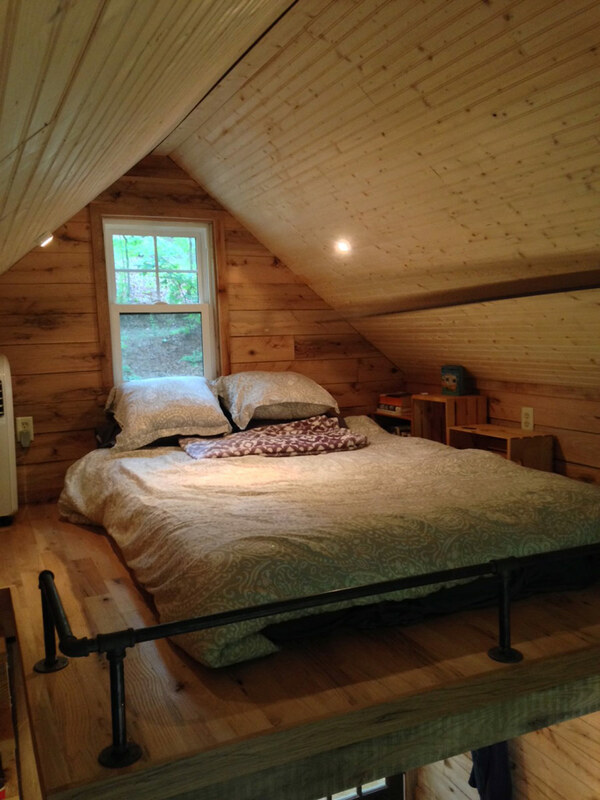 I love the stairs, and the fact there is some headroom in the sleeping area. Great job! this is one of the best layouts i’ve seen while still keeping the sq footage really small. excellent job, guys! this is wonderful. Beautiful craftsmanship & layout love it! 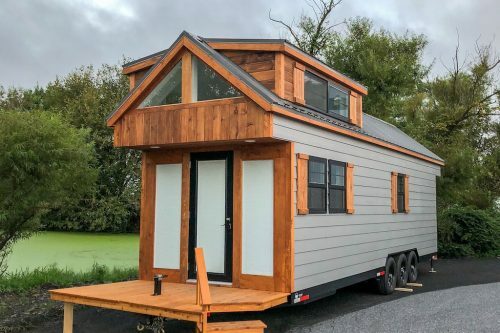 I am wondering how much you charge to build a home like this with a 4 X 6 back room added to the length to sleep and a hook up for a wood stove in the living room, and a solar system for electric and hot water, maybe propane. I live in CT and have the land. I would like log siding and the wood interior, pine is fine. I’m trying to sell our house to put a tiny house on my lot.next to it. How much would this cost. You could build it on a trailer where you are and drive it here with a big pick up truck if it is easier. I’m a single mom, looking for a more affordable way to survive. Finally! 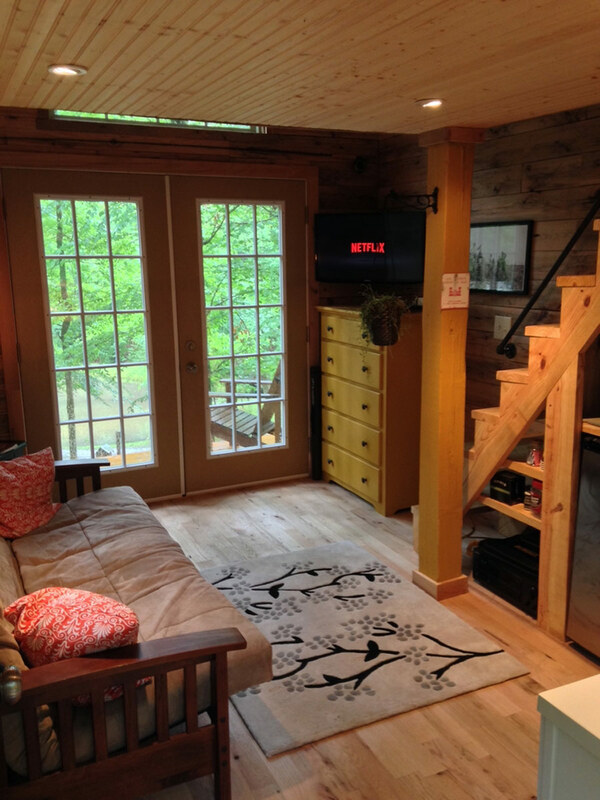 A tiny house with stairs I can climb. Please post some photos of the kitchen. LOVE the stairs, altho’ entire place is adorable! Love this house! Would like to see more of the kitchen area! I love everything about this house. Beautiful job. 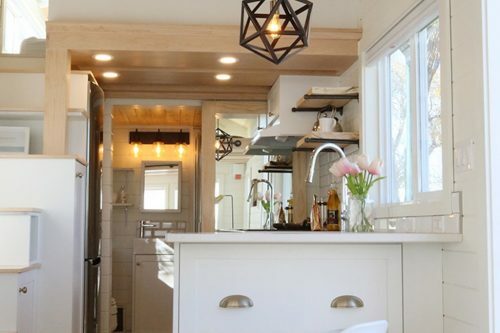 Is there more to the kitchen than the Keurig and refrigerator?? Is there a shower?? This is spectacular. I agree with the others here – the stairway is most welcome, and there’s even a railing. Plus this house has charm. I’d like more info on the bathroom, though. And how much? I am currently working on a pricing sheet. I think I underestimated how quickly this has snowballed via social media! I still have about a week’s worth of work to actually completely finish the house (although it looks finished in the pics, you’ll notice that there’s not even a faucet on the sink yet!). I will have a page dedicated to pricing on my website in the very near future. To give you a rough idea – if I were to build an EXACT duplicate of our house, it would be in the $30K range. Keep in mind that I have a LOT of labor in this house; probably more than I would have in a build for a customer. We used a lot of repurposed/excess material that presented some interesting engineering! Yes, we saved on material cost, but it was exceeded by the labor. VERY nice! If you ever have an open house, I’d love to come see your Otter Den. We live in Woodstock, GA, so we are close by. I really like this and would like to see it in person. I have a place a couple hours north of there in Dunlap, TN. When I tried the link to Otter Hollow Design, it only brought me to some photos, no contact info. 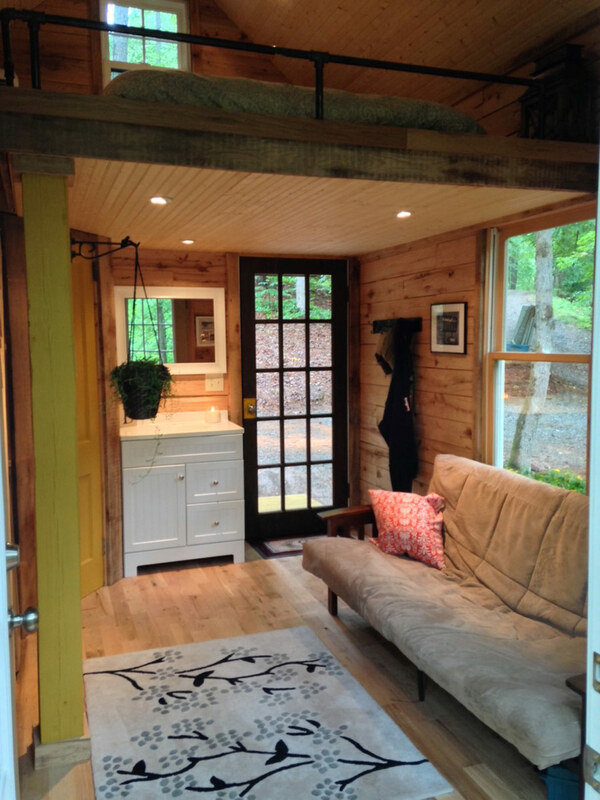 Can tiny homes be built in Savannah GA or near there? Love your house & interested in price. I find this design charming and could picture living in it. There is a bit of kitchen lacking, but I’ve always envisioned a tiny home co-housing community with a central space for cooking and eating together as desired, and a bath house. It’s nice to see tiny with character! Very well done. 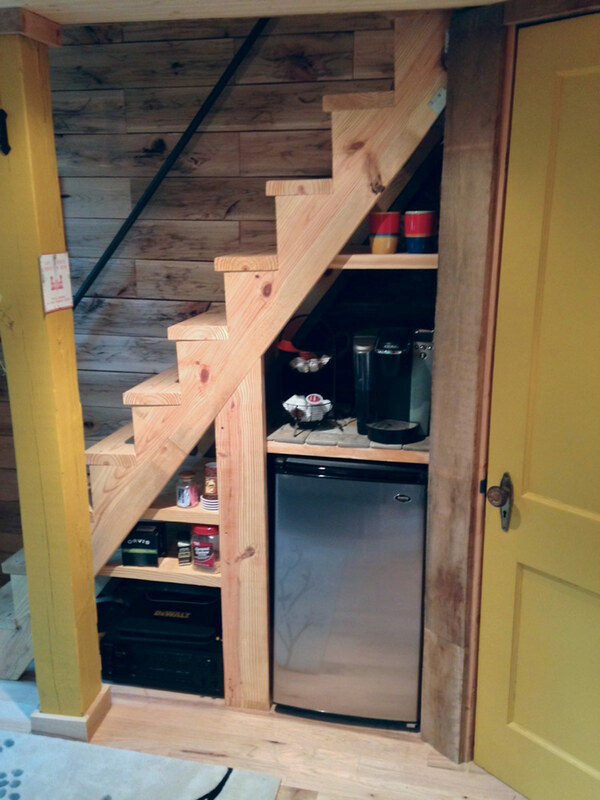 Like the stairs, storage, nicely finished too. 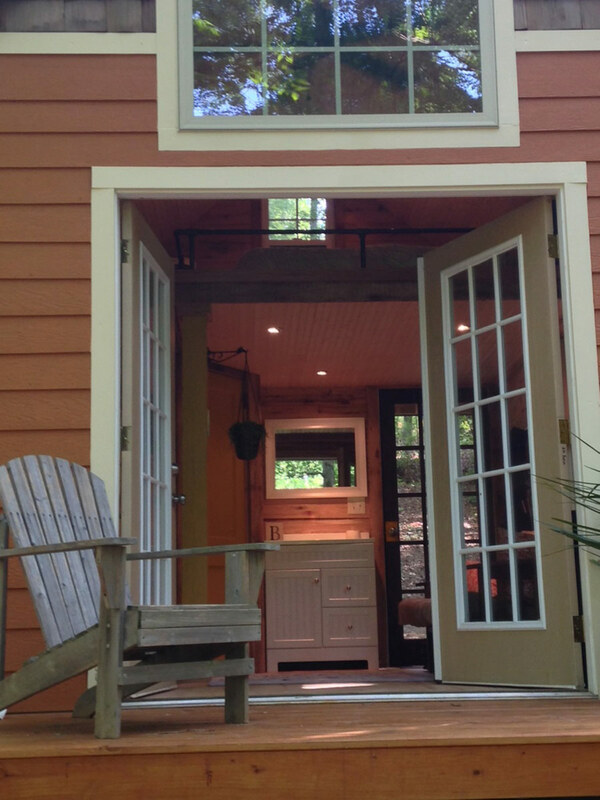 I agree that adding a wrap around porch would add to this sweet little place. An otter’s place of residence is called a holt or a couch. Otter’s Couch might not have the right ring to it for some, though I like it. Otter’s Holt is very Hobbit- well, it is a word as old as (or older than) the English language. Nice work all around on the house. But that trip rail around the loft edge gives me the willies. Very bad height, maybe worse than no rail at all. The edge does need at least a visual warning, a couple of stout ropes hung from above, a cargo net, a long branch across the opening. 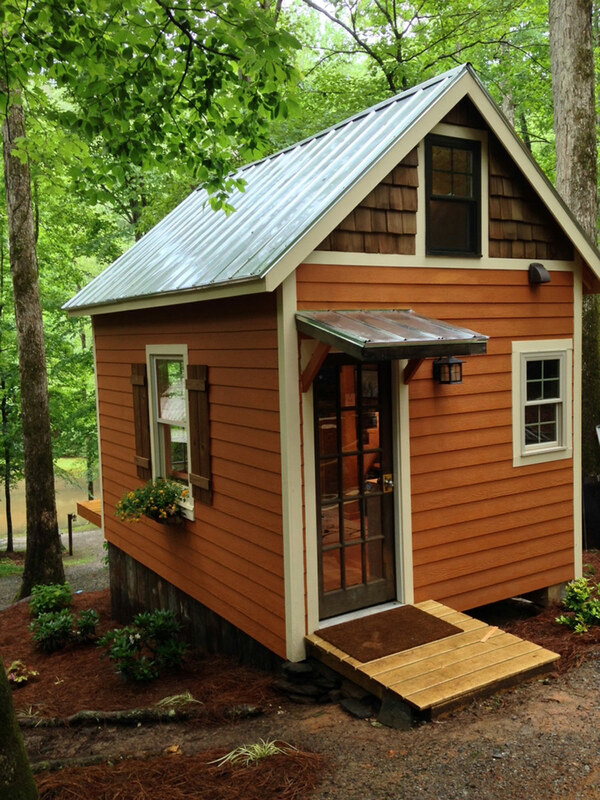 So many fun possibilities in so cute a dwelling! make one for me James? This is perfect and I love the attention to detail! When I retire, I want something just like this, in a similar setting. Beautiful. I’ll have to write down the name of your company. Very sweet place. I love the roomy upstairs! Great setting too. I live in Woodstock and am interested in seeing your prototype first-hand. 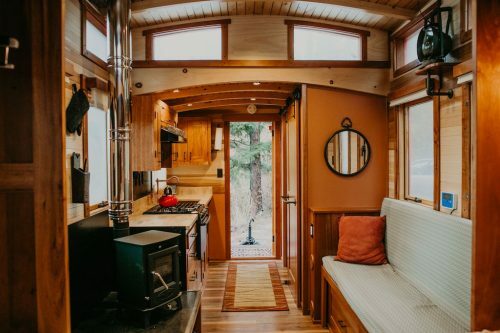 I am seriously interested in a future tiny home. I live in Canton and would love something like this on my property for guests… Do you build these? I am a widowed grandma who lives in Canton. My house is too big for me now. I would love to downsize some, but would need a downstairs bedroom as I am unable to climb the steps. 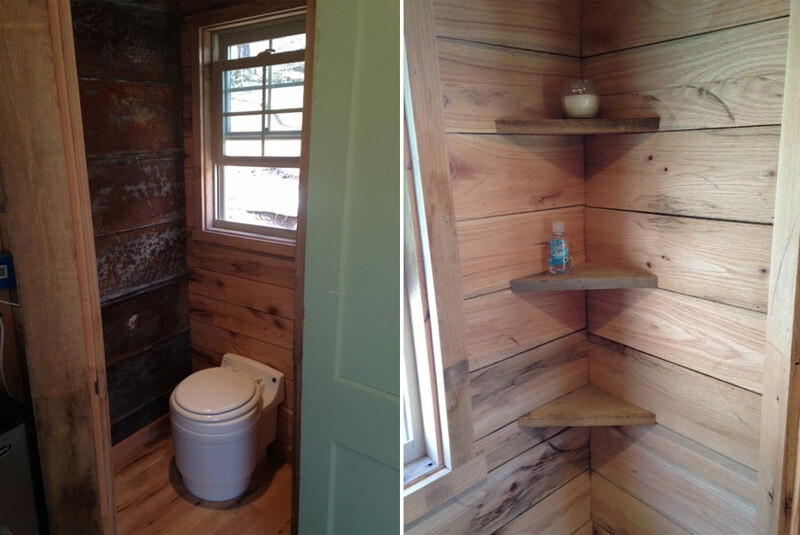 I would also like regular plumbing especially toilet and shower and a carport would be nice. It wouldn’t be so small with all of this, but functional for me.